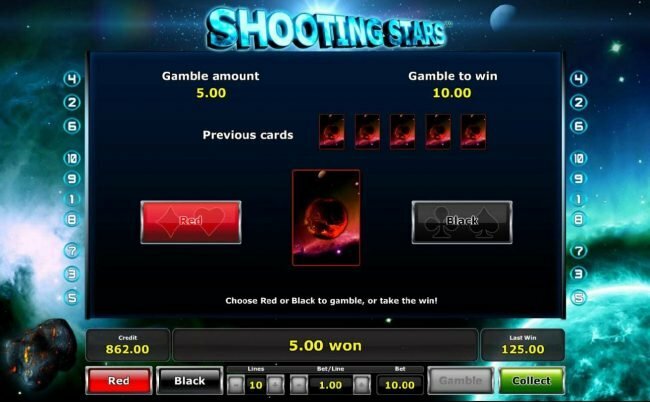 Shooting Stars is a 5 reel online slot with a max payout of $50,000 using the outer space adventure theme. Shooting Stars Slots has not been reviewed yet, be the first to rate this slot. 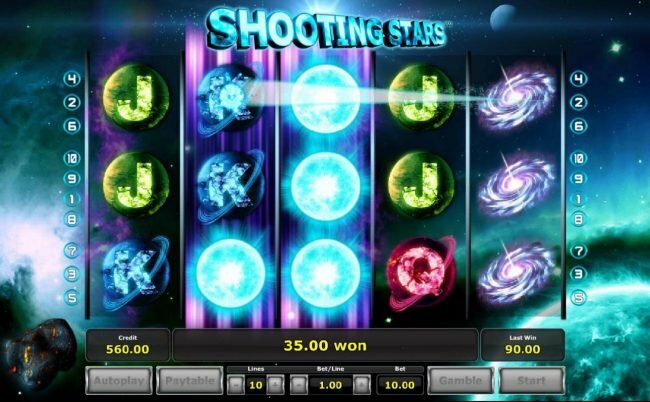 Shooting Stars is a 5 reel, 10 payline Novomatic slot that is themed around the depths of space and finding new planets and galaxies for humans to live upon. 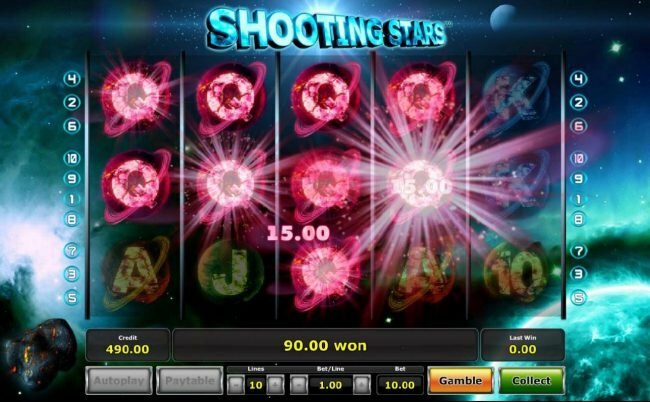 While traveling the cosmos, re-spins, and wild symbols will greet you along the way, as will a jackpot of $50,000.00 should you find the habitable planet is reached. This is one of the most appealing games from this developer in terms of its visuals. The background & reels interact with one another in a harmony fashion. Space dust, solar flares, super nova’s, meteors, moons, stars and the darkness of space will all be displayed in the background. 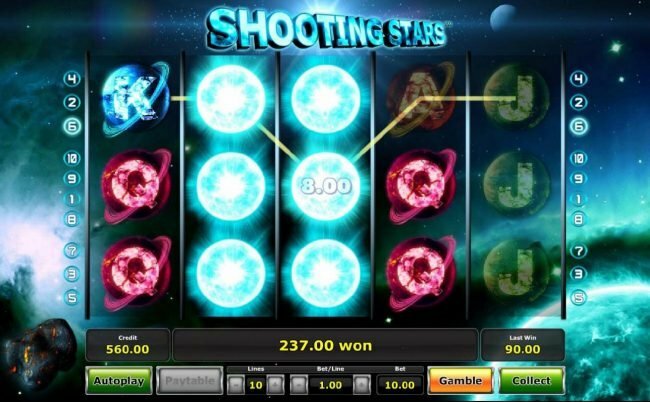 The reels showcasing a Supernova planet, a burning sun, a spinning galaxy and space themed poker suits for slot symbols. 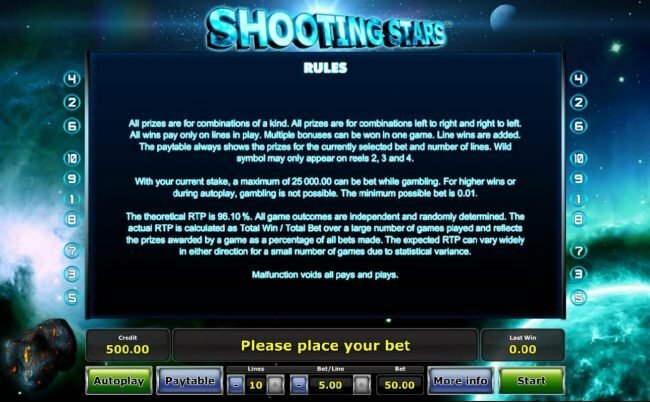 Triggerable game features & sustainable payouts are awardable via these icons. 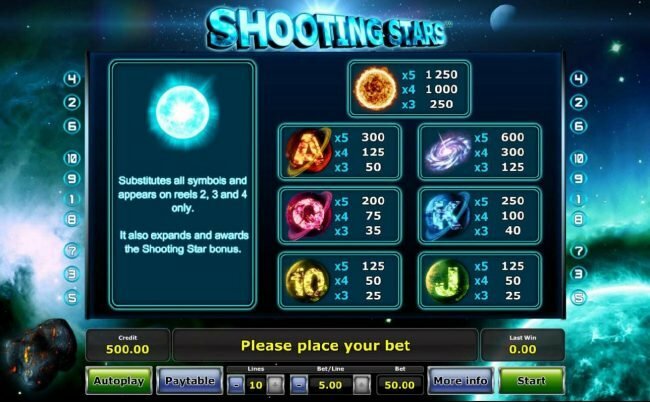 Placing a wager in this Slot isn’t complex. Only the paylines and coin must be chosen, and this is pretty simple to do and found below the reels. 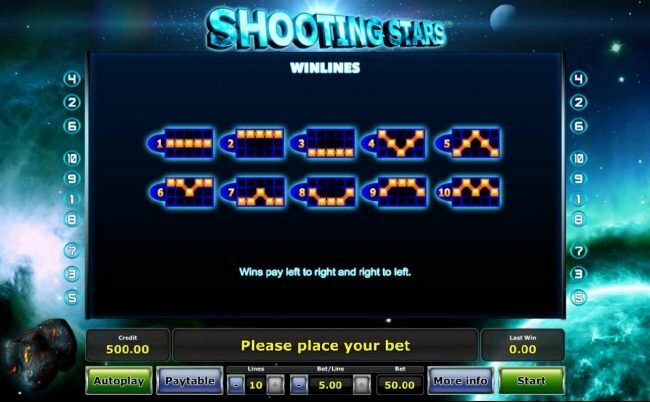 The cost per line ranging from $0.01 to $5.00., and should you opt to wager max bet, it will be $50 per spin. Thereafter, all that is needed is to click spin, sit back and enjoy the stars. The Supernova Planet takes on the roll of the wild and appears on the 2nd, 3rd, and 4th reels. When it does appear, it expands across whichever reel it stopped on and will allow for multiple wins to occur. This can happen on all three reels simultaneously. It will also trigger a re-spin to allow for other possible wins or additional wilds to land in position. 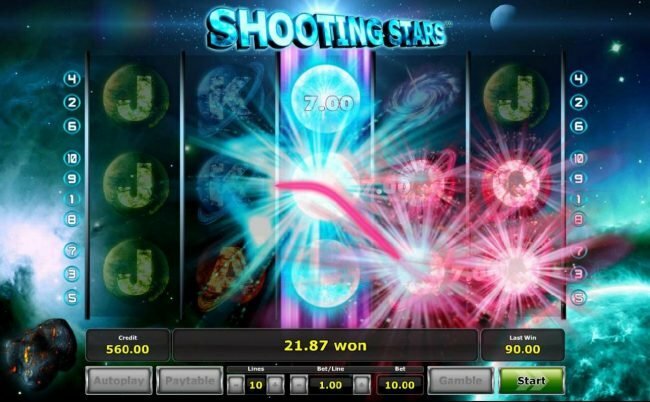 Shooting Stars is solid in its visuals and in its gameplay. 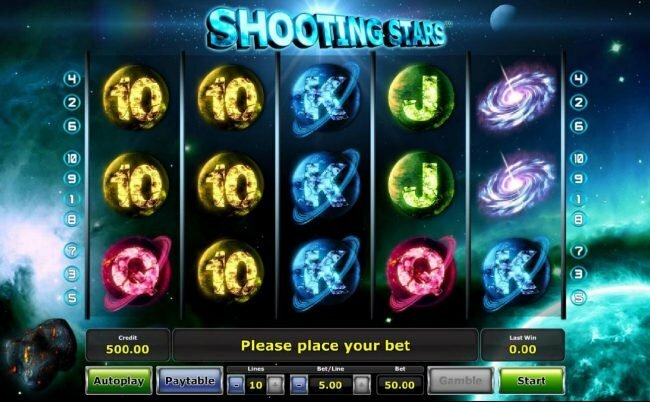 The simplistic style of play is enjoyable and often forgotten in today’s Slots. The features, albeit very limited can pay really well when you consider up to three reels being wild can occur.